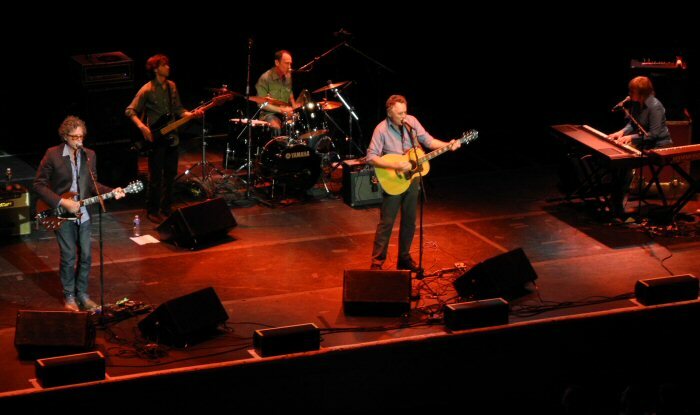 The Jayhawks landed in Montclair, New Jersey to perform at the Wellmont Theater on September 14, 2012. The venue is located in the heart of a thriving downtown with plenty of restaurants and shops to explore before a show. The Jayhawks at the Wellmont Theater in 2012. The Jayhawks formed in 1985 in Minneapolis, Minnesota. Mark Olson (acoustic guitar/vox), Gary Louris (electric guitar/vox) and Marc Perlman (bass) are original members who are in the 2012 lineup along with Karen Grotberg (keys/vox) and Tim O'Reagan (drums/vox). The band has had their fair share of triumphs and trials in their decades together. 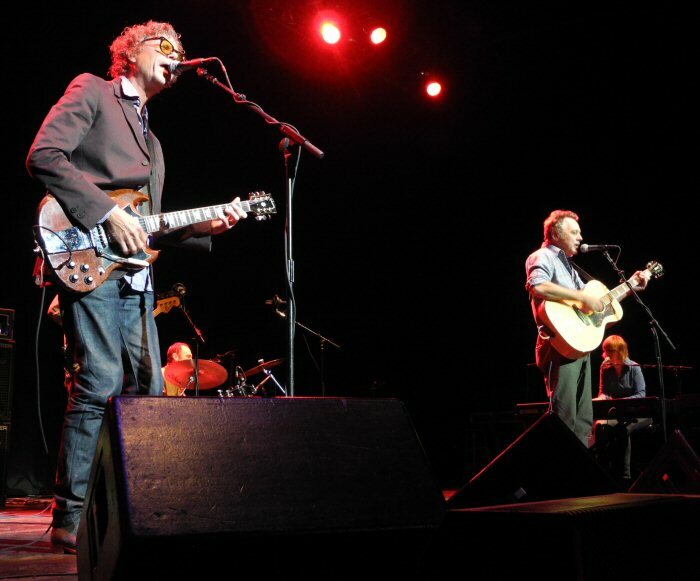 Currently, The Jayhawks have a stable line-up, a steady following and are touring in support of Mockingbird Time, which was released in 2011. The record captures the essence of their appealing sound which is a mix of alt-country, folk, harmonies, rock and roots. Their stage set up was simplistic with just a black curtain behind the amps and mics. The Jayhawks were warmly greeted as they walked out. They opened with "Wichita". The song was a fine blend of harmonies backed by instrumentation with Gary playing a short electric guitar solo during the song. This pattern was consistent throughout much of their set. The concert showcased their signature style of harmonies and vivid storytelling although they did have a few technical difficulties with a buzzing stage monitor for much of the night. "Red's Song" - written for keyboardist Karen - was colorful with the piano floating to the top of the mix in parts. It was followed by a melodic and tasteful version of "Two Angels". "Closer to Your Side" from the new record captured the band's classic sound with layered vocals, reflective refrains and solid musicianship. There was a bit of chat and thanks between songs but the main focus was playing the music in a professional but not flashy manner. Although on the next track, Louris stood in front of his amp for a bit of feedback effect. "She Walks In So Many Ways" was spirited. It was followed by "Blue" a fan favorite that reflected well the blend of instruments and voices that The Jayhawks are known for. Throughout the show the intricate sounds that each person was playing and singing could be heard adding to the dynamic of their songs and insightful storytelling. Up front are Gary Louris (left) and Mark Olson (right). "Angelyne" was poetic and pretty like the album version with The Jayhawks added other nice nuances to the piece. "Miss Williams' Guitar" also had some subtle changes keeping it interesting. They closed their set with a rollicking "Up Above My Head" with the crowd clapping along as Tim tapped together his drum sticks. "Tampa To Tulsa" - the first song of the encore - was sang by O'Reagan. The track still speaks to fans both lyrically and physically and it prompted people to move in front of the stage. The crowd remained by the stage for The Jayhawks' engaging versions of "How Can I Send Tonight (There to Tell You)", "Waiting for the Sun", and "Bad Time". Thus, finishing their concert on a high note. 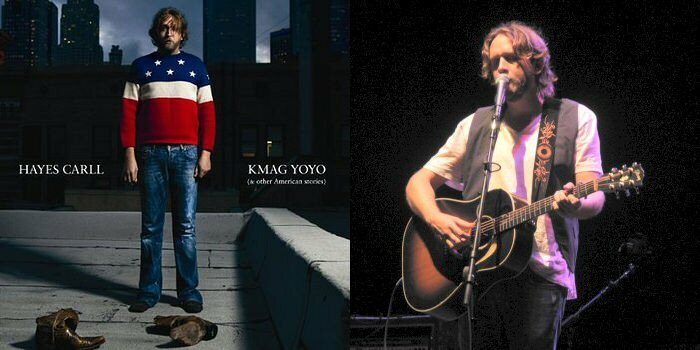 Opening for The Jayhawks was Hayes Carll from Houston, Texas. He strummed an acoustic guitar and sung his stories about life. Carll chatted a bit through songs and shared a funny tale about getting busted at the Canadian border for an illegal orange. His songs ranged in tempos and his lyrics touched on topics that people could relate to or laugh at. Carll's song entitled "Another Like You" was a piece that was originally penned to be sung by a man and a women. By using a trick Hayes had learned from Rhett Miller he sang the male part facing one direction and the female part looking the other way. It was a witty song about a blind date between two people with very different views. In closing Hayes thanked the crowd and mentioned that he had the pleasure of being at the Wellmont before with the legendary Levon Helm, which had led to an invite to Levon's grandchild's birthday party - "best four year old party ever" - said Carll. The Wellmont Theater off of Bloomfield Avenue in Montclair has a wide range of artists scheduled including Snoop Dogg, NeedtoBreathe, Anthrax with Testament, Celtic Thunder, Fiona Apple, John Legend and The Indigo Girls. Please visit www.WellmontTheatre.com for all their up-coming concerts. Opening for The Jayhawks was singer-songwriter Hayes Carll.